The crunchy kibble and soft meaty centre of delicious pockets make WHISKAS® food for cats, with Real Chicken, Salmon or Tuna the evolution of great tasting nutrition. Available in 500g, 2kg, and 4kg bags. WHISKAS ® with Tuna is rated 4.4 out of 5 by 37. Rated 1 out of 5 by Jewels from Never again I have been buying Whiskas Tuna variety for a while now, my cats seemed to enjoy it. The latest bag I bought was ordered off Walmart.ca website and arrived crawling with tiny little bugs. The girls at the Walmart returns counter wouldn't even open the garbage bag I had to tie it up in, as the bugs were abundant and visible through the bag. Switched to Purina in a nicely sealed, should-be bug-proof bag. I refuse to feed my cats a bag o' bugs, not even sure what kind of bugs they were. Rated 5 out of 5 by JENNARPE_3411183734 from I have two cats and they loved this product, what I think they loved most is the different textures throughout the kibble which made it feel like they were getting treats along with the meal. We have a dog as well and we had a hard time trying to keep her away from the food because she wanted to eat it as well. All around a great product. Rated 5 out of 5 by STACEYPNL_3411182314 from The product package was very appealing. When I set the bowl of food down for my cat he seemed to love it and ate a lot of it before stopping. He ate it even faster than he eats the meaty selections which used to be his favorite. Now he has a new favorite food! Rated 5 out of 5 by JILLBNS_3411155591 from I have 3 cats and find it very hard to find a food that they all will eat. Whiskas Meaty Selections has always been a favorite of theirs but they devoured the Dry Tuna. Empty dishes every time! Will definitely be buying this when the sample bag is empty! 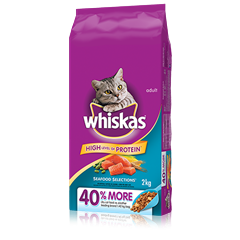 Rated 5 out of 5 by DIANE_JON_3411153905 from My cats absolutely love whiskas dry cat food. It was the first time I bought the tuna flavour and they enjoyed it very much. Will definitely buy it again and recommend it to friends and family! 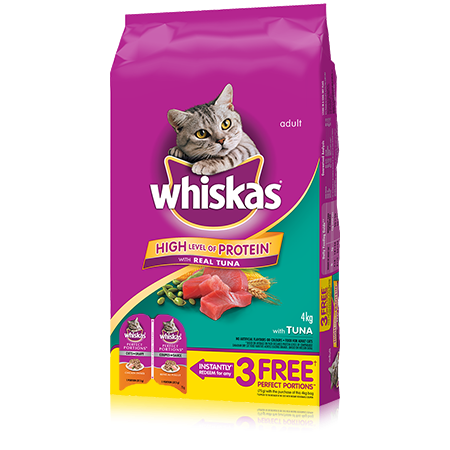 Rated 5 out of 5 by TINADNB_3411182068 from My 2 cats are very fussy and I had no issues introducing Whiskas to them. They really like it because they did not turn their noses up at it. I am having great results with Whiskas Tuna. 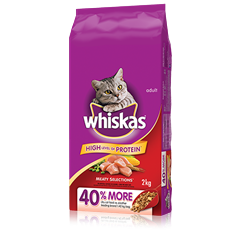 Rated 4 out of 5 by SARAHQON_3411168629 from My cats usual brand is Whiskas chicken, so switching to the seafood flavour was a nice change for a meal for them! They did eat it and there was no real change to their diet which was nice. Rated 5 out of 5 by KRISTENCON_3411165826 from My cat gets so excited now when I poor his bowl of food. He comes running to his bowl no matter where he is in the house when he hears the first nugget drop. My cat deserves the best. CHICKEN BY-PRODUCT MEAL, GROUND YELLOW CORN, CORN GLUTEN MEAL, ANIMAL FAT (PRESERVED WITH BHA), SOYBEAN MEAL, NATURAL FLAVOUR, WHEAT, TUNA, WHEAT FLOUR, RICE, POTASSIUM CHLORIDE, SALT, VITAMINS (CHOLINE CHLORIDE, dl-ALPHA TOCOPHEROL ACETATE [SOURCE OF VITAMIN E], VITAMIN A ACETATE, NIACIN, VITAMIN B12 SUPPLEMENT, RIBOFLAVIN SUPPLEMENT [VITAMIN B2], THIAMINE MONONITRATE [VITAMIN B1], d-CALCIUM PANTOTHENATE, VITAMIN D3 SUPPLEMENT, BIOTIN, PYRIDOXINE HYDROCHLORIDE [VITAMIN B6], FOLIC ACID ), TITANIUM OXIDE, TAURINE, dl-METHIONINE, TRACE MINERALS (ZINC SULPHATE, COPPER SULPHATE, MANGANESE SULPHATE, POTASSIUM IODIDE), WHITEFISH MEAL, IRON OXIDE, BHA, BHT. WHISKAS® with Tuna is formulated to meet the nutritional levels established by the AAFCO Cat Food Nutrient Profiles for adult maintenance.